It doesn't get much more 80's than this. 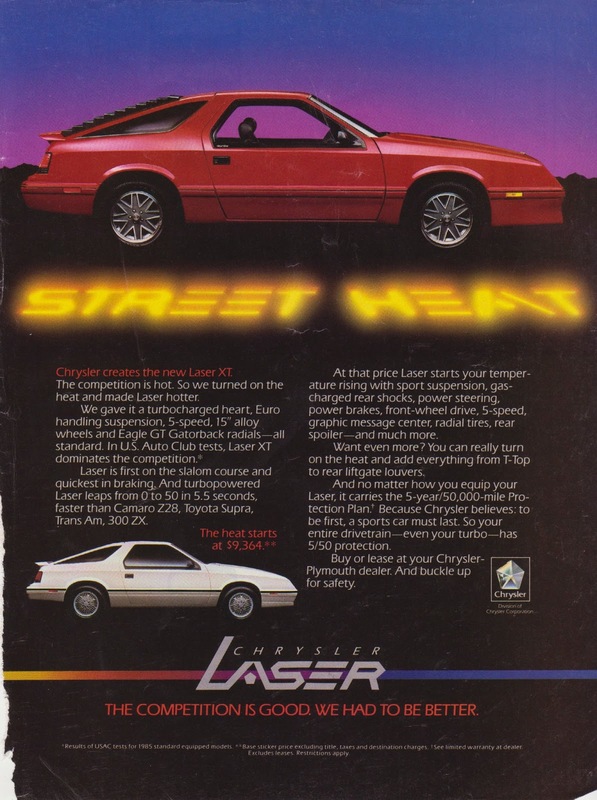 In this installment of AdverTimeWarp we've got a "turbopowered" 1985 Chrysler Laser that claims to be bringing the heat. A casual read reveals it's stunning 5.5 second 0-50 time. That's pretty fast even for modern standards. Wait a minute, 0-50? What we have here is an acceleration metric that showed up in advertisements during the 70's and 80's when cars had 0-60 times that were simply embarrassing. For comparisons sake, a carbureted first generation RX-7 had a 0-50 time of 6.5 seconds. 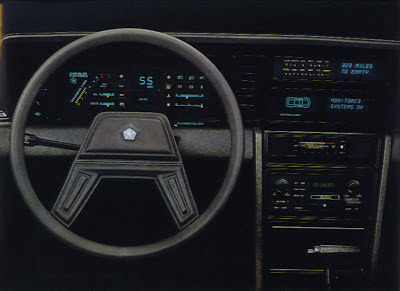 The Laser's interior was both old fashioned and futuristic at the same time. 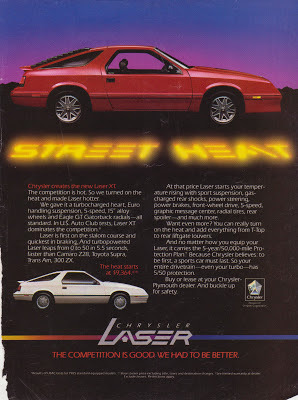 But Laser owners had little to be ashamed of as the 2.2 liter turbo mill produced 146 horsepower and a gutsy 168 lb/ft of torque. The little Chrysler (along with its Dodge and Plymouth siblings) represented an interesting alternative to the Celica and Prelude of the day. With it's swept B-pillar and rakish rear end design, the Laser features design cues shared with the Porsche 928, second generation Mazda RX-7 and third generation Camaro. This is also a car that looks great with rear window louvers for the full 80's trip.